Jak Wilmot is a storyteller based out of Atlanta, Georgia and co-founder of VR studio, Disrupt! He loves film, games, & coffee. 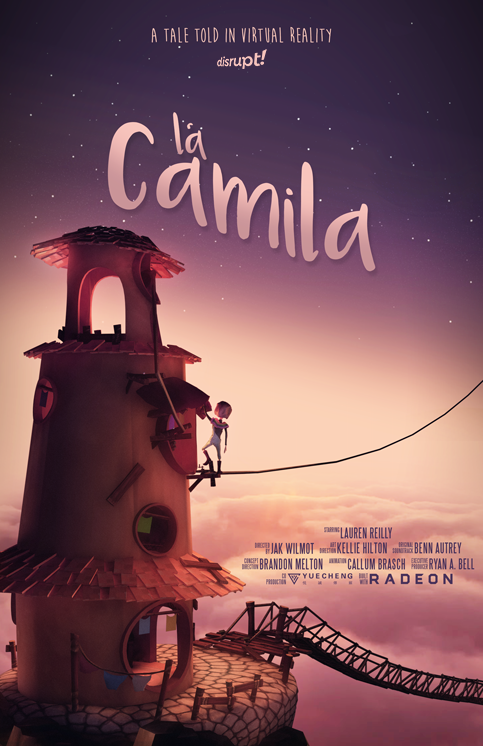 His newly released VR experience, La Camila, is available for Vive & Oculus. He joins VRARA's Storyteller Davar Ardalan to talk about animation techniques in VR and why his focus is on distributing at cinemas and arcades versus digital sales. 1) How did you get into VR? Throughout high school I dabbled in 3D animation, releasing short films on YouTube and experimenting with game-based storytelling. So when the current gen VR headsets were released, it was a medium that felt like the perfect mixture of gaming, storytelling, and animation. From there, my business partner Jordan and I combined talents to create Atlanta's first VR animation studio, Disrupt. 2) Tell us more about La Camila, based on Coelho's The Alchemist. So La Camila was born out of a late night reading of Coelho's The Alchemist. I was captured by the concepts discussed in the book: finding one's path, working with the world around you, keeping balance in the face of chaos. The goal was to create a world that deals with those heavy themes, while also remaining lighthearted with goofy sheep & a father/daughter story. I'd say I'm still figuring engagement out. It's a balance between keeping the viewer focused on your characters but also providing pathways that they can discover on their own. For example, I don't explicitly say what has happened to Camila's mother; however, if you physically move into her father's room, you can see a family portrait. 4) How are you monetizing your work in VR? With the headset user base being objectively small, we've focused on distributing via location-based VR cinemas & arcades, rather than digital sales. 5) Where do you see the industry heading in the next 2 years? My hope is that AR/VR HMD's will be designed to look more appealing. The tech is there, but until a teenager wants to wear one in public, it will still be a niche device. For instance, my generation didn't carry around blackberry even though it was more capable than a flip phone. Only until the iPhone rolled around mixing style with tech would you see them in the lunchroom. Davar Ardalan is the founder and storyteller in chief of IVOW, an AI-powered storytelling agency, and Stanford Affiliate. Ardalan is also the Co-Chair of the the Storytelling Committee of the VR/AR Association and has been recognized with a 2017 NASA Team Leadership award for Space Apps, a Gracie Award from the American Women in Radio and Television and a shout-out in the popular comic strip Zippy.